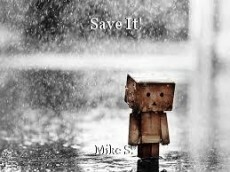 Save It!, poem by Mike S.
Trying to defend the indefensible! and defend the indefensible, and try to justify the unjust? his way into the white house, a man built on lies and deceit. that isn't it at all, it's that we're about to be lead by a serial abuser. except himself, at the cost of our Democracy that's about to come undone. and his bullying bluster should, but doesn't, speak volumes. a disguise, so people forget, you once supported an ego-driven nightmare. I'd hoped this day would never come, Mike. Brilliantly put!! Thanks, Hully, and so did I, so did I!